WHY SHOULD YOU CLEAN YOUR DECK ? There are many reasons why cleaning and sealing your deck and exterior wood is important. 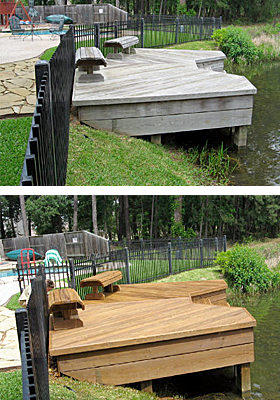 Your deck is an extension of your home, a place to entertain guests or just relax with the family. We all want our decks to look nice but to do it correctly it takes time, patience and knowledge. 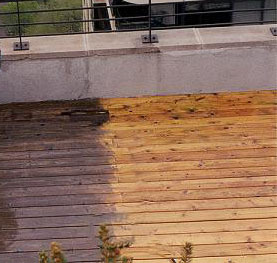 To take the guess work out of it, hire a professional deck care company to do it. A professionally maintained deck can last decade’s and add value to your home. We take pride in our work and we leave your highest expectations satisfied every time. If you don’t protect your deck or exterior wood over time exposure to the elements can lead to graying, splitting or mold & mildew growth on your exterior wood which will cause decaying. Protect your investment with our deck cleaning and wood restoration service that brings back the natural beauty to your deck or exterior wood. A lot of contractors add the power washing/deck cleaning service without proper knowledge of wood care and sealers. We are Certified Wolman wood care contractors. Wolman is the largest wood preservation company in the world, their products are probably already in your home from your windows or any treated exterior wood. Quality isn’t expensive it’s priceless. A few things to think about before you have your deck cleaned. What type of stain do you want, transparent to show the natural grain of the wood or a solid to match the decor of your home or we can go two tone? If you choose to have Midwest Maintenance take care of your deck cleaning or wood care we make the process a lot easier by bringing a sample booklet of color choices and let you know the benefits of either choice. Previously painted / stained surfaces? Not a problem! First off we do a survey of the wood, what type of wood your deck is made of . The condition of your deck, to make sure that it is still restorable. Then see if there is a sealer present on the wood, if so the deck must be stripped. Once your deck is stripped then the process of brightening the wood and neutralizing the alkaline based stripper to make sure the stain sealer adheres properly. If your deck does not have any previous sealer we will clean the deck with a percarbonate based cleaner to take the old gray wood off. Once all the gray dead wood and old sealer has been removed and the Wood has been brightened, your deck has officially been cleaned. Then once the deck has been cleaned we work on the finishing process. that starts with a light sand on the deck to remove any wood furring or chipping. Plus when the deck is sanded it gives the sealer a much better place to penetrate deep into your deck to protect it from the Midwest seasons. Then once sanded we prepare for sealing your deck. the deck will be swept or blown off to make sure there is no debris to get in the way of a perfect finish. Then if needed we tape off siding, flowers or anything that could be affected by the sealer. Then for the sealer and how it is applied , every job is different. 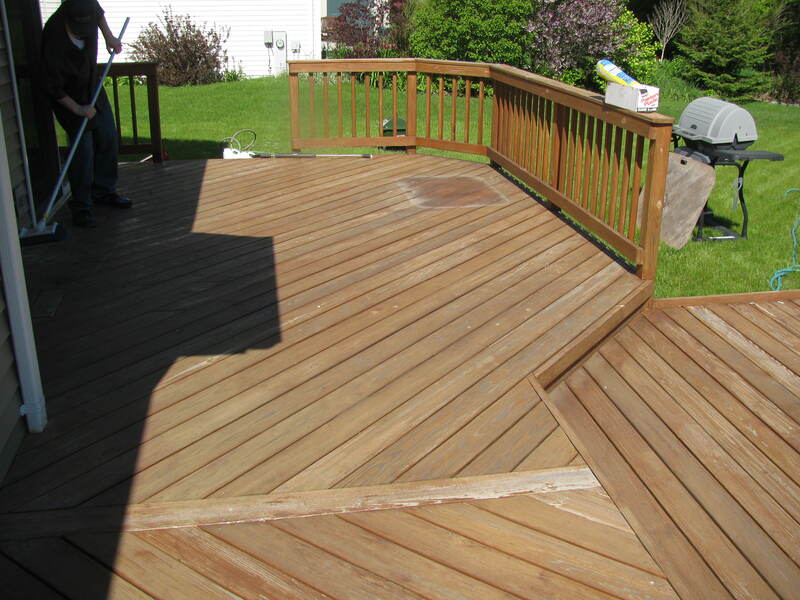 A lot of the time we hand apply with stain pads or if the conditions are right we will spray finish your deck. Want to see exactly how much better your wood could look? Call for a free demonstration & estimate!